Our niece from England recently visited, and here is her “guest blog” – enjoy! It’s hard to believe this is the second holiday season since we returned from Florence. Now that the newness of being home has worn off a bit, the rose-colored remembrance phase has set in. Florence truly was a wonderful place to be during the holidays – the lights, the festivals, the food…. This blog post reminds me of that unique mix of excitement for Florence and longing for home that is still palpable as I read it. Happy Holidays to all!!! It’s almost hard for me to believe how many festivals there are here in Florence. I think I’ve just decided that festivals are a part of everyday life – like little food markets, the passeggiata and cappuccinos (and, “purtroppo,” the post office). Seriously, I can’t remember a weekend in the past several months where there wasn’t at least one festival or festival-like happening. And now that it’s the holiday season…well, you can do the math! Today I am going to give you a peak into the local theater here in Florence – the Odeon. While not entirely dissimilar, going to the movies in Italy is a bit different than going to the movies in the States. First off, the theater here is located in a palace that was built in 1462 (Palazzo Strozzino) – a far cry from a theater in a shopping mall, to say the least! 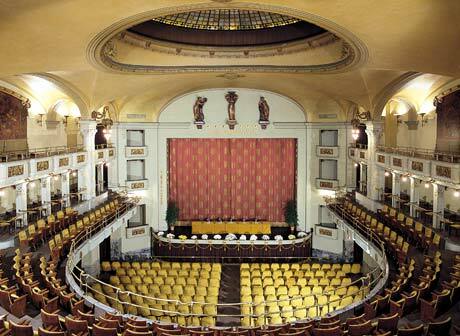 The inside of the palace was renovated into a theater in 1922 and decked out in the art nouveau style. (My pics weren’t coming out good inside, so the nice photo is taken from their website). You can take a virtual tour of the Odeon here (if you do, check out the ceiling). On Mondays, Tuesdays and (some) Thursdays, the Odeon has its “Original Sound” program, where the films are shown in their original language (whatever that may be), with Italian subtitles. A few weeks ago The Hobbit was here for only a couple of days, so we went to the movies on a Monday night (we are such party animals here!). Well, there was one big difference we noticed immediately (after noticing the amazing building we were in) – no fresh popcorn! I have to admit, my heart sank a bit as a bucket of movie-theater popcorn is an indulgence I learned from Steve, and one to which I have grown accustomed. We settled for a bag of popcorn from the snack counter (pictured). On the other hand, had we wanted (we did not) a lovely glass of red wine to bring into the theater, that of course was available. Another interesting thing was the not quite complete “originality” of the language. For those of you who have not seen it, in The Hobbit both Elvish and Orkish (is that a word?) are spoken. Since most of us don’t speak those made-up languages, subtitles are provided. However, as with the rest of the movie, those subtitles were also in Italian, not English (as the subtitles are in the original movie), requiring me to do my best to translate out-loud for Steve (not that Orks have anything very intelligent to say). I thought it was an interesting glitch in the “original sound” idea. One very cool thing about this movie-going experience was that the movie started right away at the time scheduled – no previews and no ads (yay!). (I actually have no idea if this is because it was in English and all the ads/previews would be in Italian, or this is the way all movies here are – if anyone knows, please post a comment). Other than that, the movie-going experience was fairly similar. The prices were about the same (a far cry from the 36,000 yen we unwittingly paid in Japan to see a second-run matinee! ), and it was seat-yourself (also unlike Japan where you get assigned seats). The only other surprise was that, unlike the 2 other movies we had seen in other theaters in Italy, there was no intermission. We enjoyed the movie and were treated to a caught-just-in-time bus-ride back home. Thanks for coming along! Today I delve a bit into cultural differences (though hopefully in a humorous and entertaining way). While the title is meant to grab your attention, I’ll try and be a little less judgmental as I explore the things I appreciate about living in Italy as well as the “things I have yet learned to appreciate.” As one commenter has pointed out, people in other cultures have been doing just fine for millennia – it’s our own perspective from a different culture that creates our discomfort. So, when you hear my surprise/dismay (usually indicated by “seriously!?!!?! ?”), please understand, as I do, that this is just one person’s attempt to understand a culture not her own. (However, it is my blog, so enough with the disclaimers already!) Onward. Of course, the food (the Italian food) and the art (which are both fabulous and really big deals here). The fact that I can walk the streets by myself at night and feel safe. This is pretty darn cool. My health card. This is truly amazing – I’m an immigrant without a job and yet I have this nifty little card that entitles me to free/cheap health care. I haven’t used it yet, so I can’t speak to the quality/wait times, but I can say that compared to the 450$+/month we were paying for employer-subsidized health insurance back in the States (not to mention the very high co-pays) it’s pretty darn civilized. The fact that prices are what prices are. For example, when I signed up for the basic 19 euro cable package I just naturally assumed that (like in the States) with the added inexplicable fees and taxes we would be paying about 31 – 33 euros/month. Nope, every month I am equally surprised to see exactly 19 euros on the bill. Not sure if it’s just Italy, or perhaps part of the Euro Zone strict financial laws, but I like it! Not having to tip. Almost everywhere we eat here we’re served by the mom & pop owners themselves, or, if there are employees, waiting is their real job for which they are paid a minimum wage. Now I know your guide books may encourage you to at least round-up and leave the change, and maybe that’s expected in touristy places, but I promise you, I have never seen an Italian leave a tip and if you try to leave one they will yell at you (a habit I have adopted when dining with visiting Americans). The only tips I have ever seen here are left by American tourists. Which brings me back to my previous point – as long as you pay attention to whether there is a “coperto” (cover charge) listed on the menu (usually 1.50 – 2.50 euros per person), then you will know exactly how much your meal will cost as there is no adding tax and tip (exception being super touristy places like Venice where there may also be a “service charge,” though always listed in the menu). Not waking up to news about another local or national shooting. Since we’ve been living in Florence I haven’t heard of a single murder occurring here (In Albuquerque it is statistically a weekly occurrence). There was apparently a murder of two African immigrants in 2011, but overall violent crime here is rare. It’s hard to get exact numbers, but Italy has at most 1/7th the violent crime of the States. The festivities. It really is a treat to be able to walk out your front door and happen upon a street market, festival, musical performance and more just about any weekend year-round (and some weekdays as well). I do believe the festivities (and the food and art) are what keep people (mostly) non-violent amidst the things in my next list…. To quote the Grinch – “All the NOISE NOISE NOISE NOISE.” Seriously – people here are loud. They yell. And they honk. And not the little quick tap of the horn to get someone’s attention, I mean the loud, incessant, you’d-be-too-embarrassed-to-honk-that-way-back-in-the-States (or too scared of starting a road rage incident) honk. My latest theory is that all the honking and yelling is folks’ way of releasing pressure (as everyone seems friendly and happy a minute later), and when combined with the festivities, explains why the violent crime rate is so low. The inefficiency of offices (post, government, bank, etc.). You usually have to wait between 30 – 90 minutes to accomplish most things (much more for big tasks like immigration – I have heard stories from folks who waited 7 hours at that office), due to the fact that everything is run like a mom-and-pop operation without any thought for efficiency and other folks’ time. For example – if it’s someone’s turn at the post office and they are trying to send mail in some special way, there will be 3 forms to fill out, but instead of having them stand off to the side while they do this, the worker will have them remain there at the window the entire time (I once clocked one person at a post office window for 25 minutes). I suppose it would be too complicated to let the next person come up because then the “take a number” system will get out of whack – but seriously?!?!?! Of course, when it is finally your turn, you will get to spend as much time as you need accomplishing your task, which may help deescalate all the “ARG” you’ve been building up watching those before you. The fact that I have to be careful not to get run-over on the sidewalk! I have seriously almost been hit by a car several times as I walked down the sidewalk, never mind the number of times by motorini. This goes back to my “Sure, Park There” blog post where I shared that just about anywhere is fair game for parking here. I can’t tell you how many mornings there’s been a car literally parked in the middle of the running trail (which is several feet off the street). Trying not to get run-over crossing the street is a whole other level of challenge (think “Frogger”), though we’ve learned the secret – people here are very gracious to folks with baby strollers – if you cross the street with one you’ll likely make it to the other side unscathed. And speaking of the sidewalk – the fact that there is dog poop all over it! It really cuts down on my ability to appreciate the beautiful architecture as, should you take your eyes off the ground for a minute, you will surely step in it. Between the dog poop, the traffic, and the fact that folks just stop suddenly and chat on the sidewalk, a leisurely “stroll” feels more like an obstacle course test for some very demanding military assignment. Smoking. I honestly don’t know why everyone here doesn’t just keel over from lung cancer. Smoking here is so prevalent (though not quite as much as in Japan). You can’t walk down the street without inhaling second-hand smoke (add that to your obstacle course), and even your own home will eventually succumb due to all your neighbors who smoke, including in the hallways. Maybe pasta and wine counteract nicotine and tar…. So, that, dear Readers are a few of my (admittedly) ethnocentric thoughts on the good, the bad and the ugly about living in Italy. I have left out many things from both lists, so will look forward to sharing those in the future! N.b. – after rereading this post about a week after I wrote it, something struck me as interesting that I hadn’t realized at the time…it seems many of the things I appreciate are huge (healthcare, lack of violence), and the things that drive me nuts are small (noise, smoking)….so you would think that the big good things would “make up” for the small annoying ones, but it doesn’t feel that way….hmmmm…….